I went into this movie apprehensive–I grew up with the original and it has a special, campy, cheesy place in my heart. 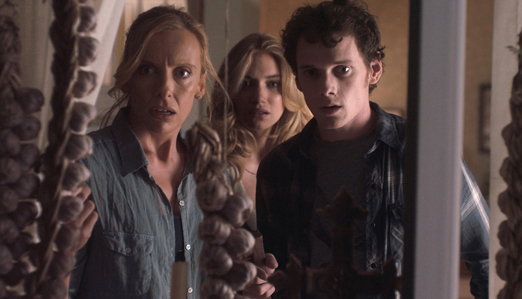 When I heard that is was being remade, I was sad but then I read that Anton Yelchin was going to be Charlie and I thought “I will give it a chance”. The movie starts off on the right note, literally–it opens with cheesy “scary music” played on an organ. This, to me, communicated that the people who re-made the flick understood the original and wanted to make this one as cheesy and campy as the original. As the music plays, you see this isolated suburb not far from Las Vegas. The point, of course, is to communicate how isolated the people in the area are to the vampire that moves into town. I liked this movie because it felt like a love letter to all those people who liked the original film. The movie does not take itself seriously, it isn’t a rip-your-throat-out vicious flick, it is tongue-in-cheek. It takes the scary moments and adds humour to it, has cheesy special effects and adds humour to scary moments. Let’s not mince words, the transformation of Colin Ferrall into a creepy vampire is gross and cheesy all at the same time. You do kind of laugh at the moment, but at the same time, if that were you, wouldn’t you be crapping your pants? seeing someone brutally murder someone you know in front of your eyes. Also, because he does convey “nerd” a lot, was good at portraying your average high school kid who wants to be popular and can’t believe the hot girl is dating him. Another fun casting was Christopher Mintz-Plasse (McLovin) as Charlie’s ex-best friend Ed. I found this casting to be slightly stereotypical, as he is portraying a nerd with next to no friends, but then, when he starts investigating all the strange murders, his nerdiness starts to vanish and I enjoyed his crazy theories and nerdy videos. 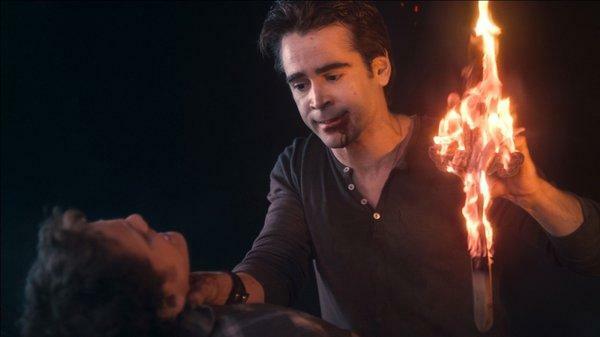 Colin Farrell was pretty great as the vampire–he hasn’t been in a lot lately, so I was nervous about him in this role. He wasn’t overly menacing, but during important parts of the film, he really did scare the crap out of you! It was fun seeing him in a role like this. 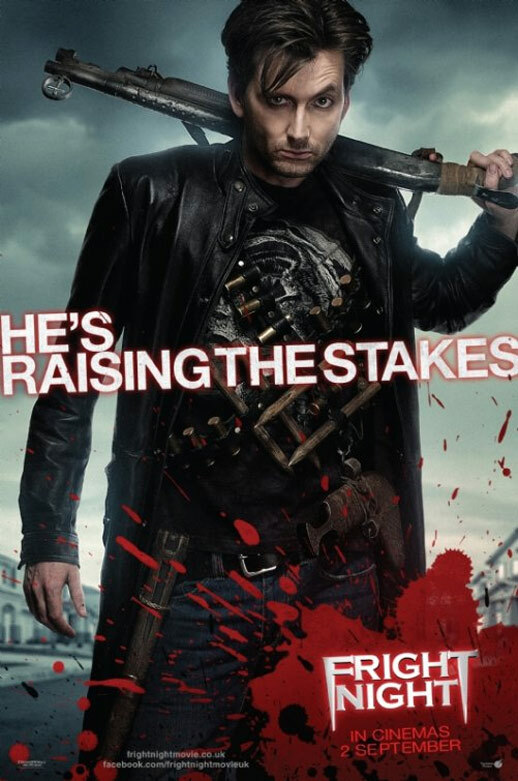 Lastly we have David Tennant as Peter Vincent–vampire slayer! He was the light in this movie! He was extraordinarily funny as the Las Vegas performer who wears too much leather and might know more about vampires than he is letting on. Every scene with him is fun and made the movie better. I would also like to add there is a fun little scene with the actor who played the vampire in the original film. Again, another reason why this film is made for those who loved the original! Overall, I am not sure that modern day audiences are going to love the movie. The movie moves at the pace of 80’s cheesy horror flicks. The death scenes are not brutal or grotesque. 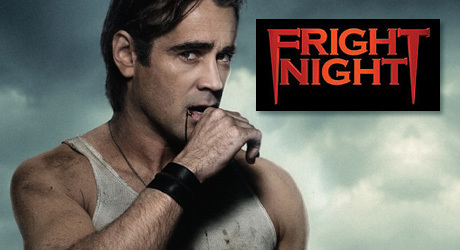 The transformation of people into the vampires is slightly comedic and it takes away from the horror of the moment. I am not sure they would understand why this movie was made like this. In the end, if you love the original, you will enjoy this movie. You will enjoy its camp value, its monster scenes and you will get its nerdy humour. ~ by xine23 on August 27, 2011.